In Love With Handmade: 2016 Challenges: Debut Author Challenge hosted by That Artsy Reader Girl!! 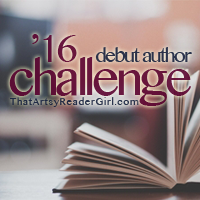 2016 Challenges: Debut Author Challenge hosted by That Artsy Reader Girl!! I'm back with another of the challenges that I've chosen to take part to in 2016!! My objective with choosing challenges is usually to hold myself accountable and to choose those that allign more closely with something that I already wanted to do. Since I'm extremely excited for many 2016 debut books and authors, I knew I needed to join a challenge and so I'll be taking part of the 2016 Debut Author Challenge hosted by Jana from That Artsy Reader Girl!! If you want to join this challenge, and I highly recommend that you do, because there are some amazing books debuting next year, HERE is the introduction & sign up post with all the rules! Once again, I've made a Goodreads list/shelf for this challenge, and so far I have 10 books only in it, but I know it'll be growing along the year and I hope to read at least 20 debuts this year! Here's my list so far! Any other debuts you'd recommend I had to my list? Let me know in the comments!! RIGHT?! I want them all nooooow!! YAY!! I cannot wait to see your list Eileen! YAY! I loved this challenge last year. I ended up reading double the goal. Hoping to do that again because there are so many amazing sounding debuts this year. Right?! So many debuts that sound simply amazing!! I cannot wait till I can read them! Yay for taking part in so many challenges next year Pili :) You are awesome. Wishing you the best of luck with reading all of these books. <3 They sound awesome :D Can't wait for your reviews. Ohhh I like it!! I think I may join this one with you. There are so many amazings coming up I drool over Star Touched Queen!! YESSSS!! Join me Britt! And YESSSSSSSSSSSSS I'm dying to get my hands on The Star-Touched Queen!! I haven't read any of these yet but I'm particularly looking forward to The Girl from Everywhere and the Star Touched Queen! Looking forward to your thoughts!